Update on PS 33 Chelsea Prep Gifted and Talented Program – Does it Again! If you’d like free OLSAT test practice questions or receive my gifted and talented newsletter please email me at skipper646@gmail.com. It’s been so crazy over the past couple of months with the launch of TestingMom.com ( the new site that helps parents with gifted and talented testing) that I haven’t taken the time to give everyone an update on the gifted and talented program at PS33 Chelsea Prep (where my daughter attends the G&T program). All I can say is that we went from “amazing” last year to “spectacular” for this year so far! Our daughter’s teacher, Mrs. Zimmerman, is another fine example of one of NYC’s best teachers! If you’d like free OLSAT practice test questions or sign-up for my free Gifte and Talented newsletter email me at skipper646@gmail.com. If you’d like to receive OLSAT test practice questions or gifted and talented newsletter please email me at skipper646@gmail.com. If you’d like free OLSAT test prep questions 0r added to my G&T newsletter email me at skipper646@gmail.com. Go to TestingMom.com to get free daily test tips along with OLSAT practice questions and Bracken practice questions. 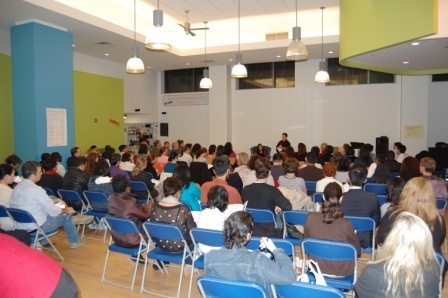 Hundreds of parents showed up this week for our 3 incredible information sessions about OLSAT testing and the NYC gifted and talented programs, private school process and of course TestingMom.com. Karen Quinn (best selling author), Dr. Kim Har from Aristotle Circle, Dana Kaplan (G&T teacher of the year) and I spoke to all the engaged parents at the Big City Moms event on the UES on Tuesday, Downtown Community Center in Tribeca on Thursday and ended the week at the Poet’s House in Battery Park City Friday night. You can read the full story on TestingMom.com and we’ll be post all the questions and answers. We plan on having more of these information sessions in the coming weeks so let me know if you’re interested in attending one!